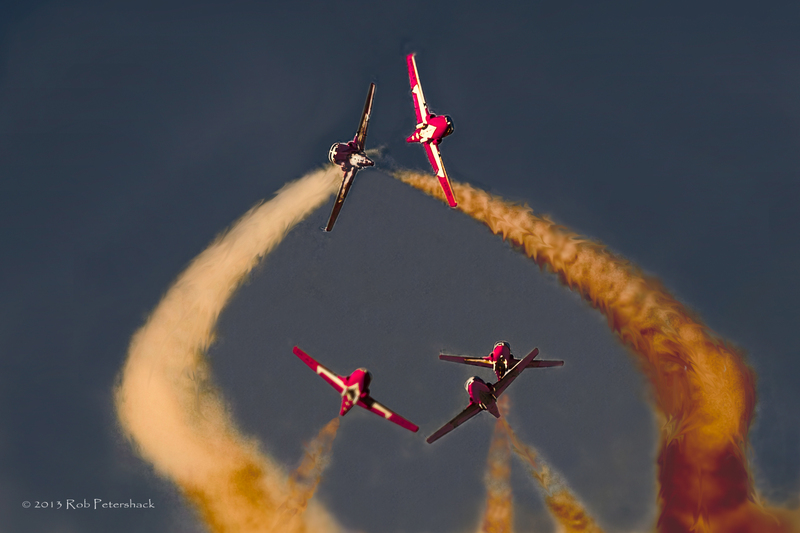 My contribution to Ese’s Weekly Shoot & Quote Challenge – Intricate is a photo of an intricate aerobatics maneuver performed by the Royal Canadian Snowbirds at an air show I attended last summer in Minot, North Dakota. This photo is (obviously) digitally enhanced (principally the color of the smoke emitted). Why? Because the original photo couldn’t capture the drama of the actual performance. I just started experimenting with this photo, which I retouched using Topaz Lab’s ReStyle Photoshop plugin. I realize this result may be seen as over-the-top by some, but having this many jets flying very fast in a relatively confined space is pretty darned dramatic. Doing this successfully is a tribute to the training and skill of the pilots. Incidentally, the artists referred to in the first quote are the members of the Snowbird’s team (including all support personnel). On a recent trip we had some bad weather at one of our stops that required our plane to be de-iced. It was very late at night and the snow was falling as the guy working the de-icing equipment carefully sprayed down our plane. I was really grateful he was out on such a cold, snowy night working to help us on out way home. De-icing a plane is critical because the build-up of ice on the plane’s surface can add a huge amount of weight to the plane in addition to affecting the plane’s handling. De-icing is usually done by spraying aircraft with a de-icing fluid based on propylene glycol, which is non-toxic. On the edge of more change than one would want the pilot of this plane was able to successfully recover from what looked like sure disaster. Here are some of my photos of aircraft in flight. These are from an air show in Minot, North Dakota on July 4, 2012. All photos were taken from the ground using a Canon Rebel T2i with a Canon EF 70-200mm f4L IS USM lens with the camera on a Manfrotto tripod and head. All shots were taken with a +2 exposure while I frantically followed planes hoping to catched a usable shot:). Minot, North Dakota suffered a devastating flood in June – July 2011. A year later the city had not yet fully recovered but members of the community organized a free air show to lift community spirits. Among the many participants were the Royal Canadian Air Force’s Snowbirds aerobatics team shown here.